Location: San Giacomo dall'Orio, Venice. Lawrence of Rome (c. 225 – 258) (Latin: Laurentius, meaning "laurelled") was one of the seven deacons of ancient Rome who were martyred during the persecution of Valerian in 258. At the beginning of the month of August, 258, the emperor issued an edict, commanding that all bishops, priests, and deacons should immediately be put to death. On 6 August Pope Sixtus II was apprehended in one of the catacombs, and executed forthwith. After the death of Sixtus, the prefect of Rome demanded that Lawrence turn over the riches of the Church. Legend has it that Lawrence asked for three days to gather together the wealth, and then swiftly distributed as much Church property to the poor as possible. On the third day, when ordered to give up the treasures of the Church, he presented the poor, the crippled, the blind and the suffering, and said that these were the true treasures of the Church. He was subsequently martyred. 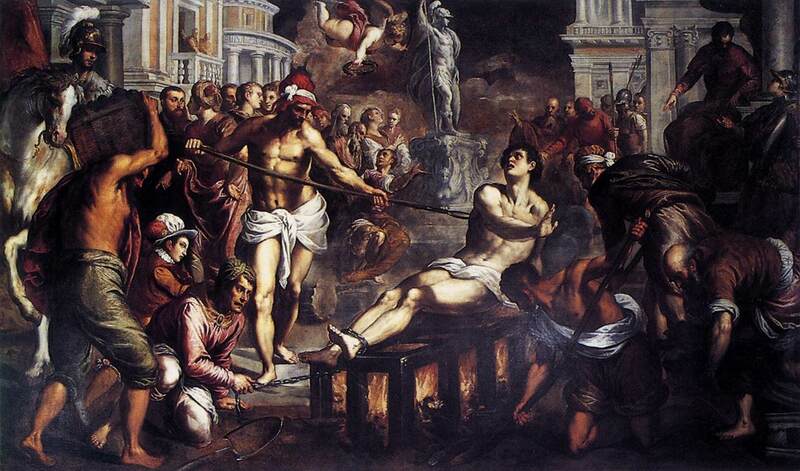 Since the fourth century St. Lawrence has been one of the most honored martyrs of the Roman Church. This depiction of The Martyrdom of St Lawrence is a rather unusual horizontal design, which has been criticized as being unsuccessful with predictable intermingling of Venetian and Roman mannerism. But the depth of field has been masterfully captured in distinct planes, creating a very naturalistic sense of depth, as does the light from the flames beneath the Saint’s gridiron. Tradition also holds that Lawrence joked about their cooking him enough to eat while he was burning on the gridiron (hence his patronage of cooks and chefs), stating something along the lines of "turn me over ... I'm done on this side." Jacopo di Antonio Negretti (c.1548 - October 1628), best known as Jacopo Palma il Giovane or simply Palma Giovane ("Young Palma") was a Venetian painter, and great-nephew of Palma Vecchio. He is said to have been a pupil of Titian, but this tradition has been doubted (it is probably based on the fact that he completed the Pietà which Titian left incomplete at his death). In the late 1560s and early 1570s he worked in central Italy, mainly Rome, but thereafter he spent the rest of his life in Venice. Adding naturalism to his Mannerist style by the 1580s, he varied the ingeniously synthesized amalgam according to subject matter and patrons' own eclectic and conservative tastes, with "virtuoso skill and a facile intelligence." After the death of Tintoretto in 1594, he became the leading painter in the Venice.